Let’s say you’re searching for a property and you want to find some information about the annual rental yields for high-end flats in London. That’s quite a specific longtail search, so you expect specific answers. You key your query into Google, and you’re presented with a website that contains some useful information. Great! Now that this business has caught your attention, you think that you’ll explore the site a little bit – but what’s this? You can’t find an easy way of navigating around the site, and there just doesn’t seem to be any structure to it. You think, Thanks for the info, but i’m off, and away you go to a different site where there’s a clear structure and plenty of advice that’s relevant to you. User Experience (UX) – If you want to turn users on your site into business, then you need to create a seamless browsing experience. When there are a million other sites for users to look at, it doesn’t take much for them to leave your site and move on to the next. SEO – When search engines scan your site, a good structure will help them to index your pages and establish what your site is about. This is especially important if your site has a lot of similar content; search engines need to know that the topics of these pages are, in fact, different. The main thing to consider is that your site should be easy to navigate. If your users have to click on your ‘Properties’ page, then have to scroll down to the bottom to find a link to your ‘London Properties’ page, then have to click on an image of a penthouse apartment to find that they still aren’t on your London property portfolio, they will drop off from your site pretty quickly. To create this all-important browsing experience, you should put your posts and products into categories, so that they are easy to find for your site visitors, which will mean that your users can get an instant understanding of what it is that your business does. This transparent structure will allow users who aren’t looking for your properties to leave your site sooner, and will help you to monitor how your site content is performing in relation to the users who do have an interest in what you do. With building developments popping up all other the place, the property sector is becoming more and more competitive. With so much competition, it’s important to get your organisation noticed by users as early in the buyer’s journey as you possibly can, which means that SEO is an incredibly important part of marketing any property – whether it’s for rental or for sale, and whether it’s residential or commercial. Site structure is an important part of SEO, because search engines scan through your site during the indexing process, following links to various pages and measuring how well they relate to each other. Creating a well-structured site will help the search engines to properly understand what it is that your site is about, and will provide the user with the most relevant page when they enter their search query. If your site features different pieces of content about the same topic, search engines have no way of knowing that these pages are linked unless you inform them (and this can be achieved through proper site structure and internal linking). If you don’t indicate that these pages are similar in topic but contain different content that will be relevant to different searchers, you could find that your site is competing with itself for a place in search rankings – a scenario known as ‘cannibalisation’ in SEO terminology. When it comes to structuring your website, think of it as a pyramid. Your homepage sits at the top of the pyramid, your category pages go beneath it, and any subcategories will go beneath those. Make sure you divide all of your existing content into relevant categories, and add them to the main menu of your site. Not only does this give your users a clear understanding of your core offerings and services, but it tells the search engines what your site is about. If your business is location-specific, for example, you might want to create a category for the specific locations where you operate. You can create a category page that links to all of your individual location pages. You can then add this category to your main menu, and create menu links to both your category page and your individual location pages to inform both users and search engines what your site is about. Make sure that your categories remain balanced. If you have a category with significantly more content than your other categories, you should break it down to accurately reflect your services. This way, you can maintain a proper link structure and ensure that your site’s purpose is clear to search engines. Your link structure not only directs users to the pages that you want them to see, but it tells search engines what your content is about. By creating relevant internal links, you are defining your category structure by creating relevant connections between your subcategory content and your category content. For this reason, you should take a linear approach to linking, by connecting your category pages to relevant subcategory pages or blog posts. For example, your ‘Locations’ category page should link to your individual locations pages (we’ll use London as the example), and these pages can then link to relevant blog posts such as “Why London Properties Will Only Increase in Value”. 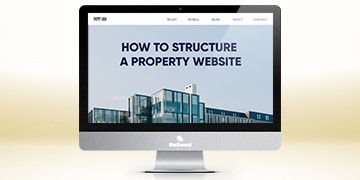 This link structure directs users who land on your website at the blog post on to a relevant product page, and informs search engines that your content is perfect for users on the hunt for a London property. In the same way that you might link to your locations pages from your blog posts, we’re going to direct you to a page where you can download our property marketing guide. So, if you want to learn more about making your property stand out from the crowd, click here to see how to put together the perfect digital marketing plan.